archival paper for you to frame yourself. 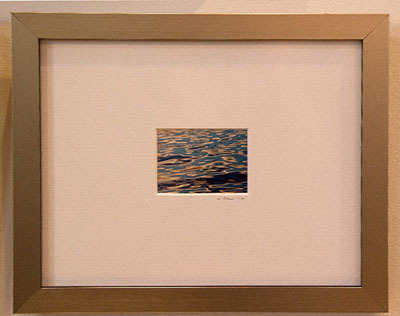 and then stretched around a wooden frame while extending the image around the frame as well. * (See Photo to the left) Adding the "mirrored edge" prevents the image from being lost to the side of the piece. You will see the full image the way it was intended to be seen. We use 1-1/2" bars for a more professional look. Our prints are UV protected and come with a wire for hanging. They are handsome, neat and trim and will look great anywhere. Please allow 4-6 weeks for delivery. (Some may be available sooner). let you know under the specific listing in the gallery. 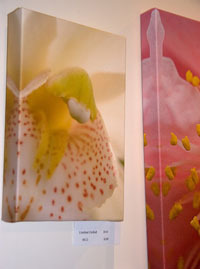 our large photographs are printed on "Elegance" paper by Breathing Color. This paper has a high rag content and was specifically designed for Epson printers. As the name implies, it truly makes the colors "breathe." Please allow 3-6 weeks for delivery. 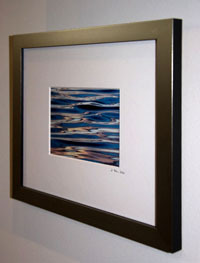 Our smaller photographs are available either matted and framed in an 8x10 silver frame with black trim (See Photo) or with mat only. All mats are archival and the plexiglass is UV-protected. Please allow 3-6 weeks for delivery. We have chosen PayPal as our payment processor. You do not need to have a PayPal account to place an order with us. if you wish to use your PayPal account to pay, or you may choose to pay with a credit card without logging in. Either way, your transaction is safe and secure. We ship via UPS and tracking numbers are available upon request. If you have any problems or questions, please contact us with complete details and we'll do our best to help you.